1. Marked by compassion, sympathy, or consideration for humans and animals. Synonyms: merciful, kind, tender, compassionate, gentle, sympathetic, charitable. See: human. Here at the Shelter, we strive to bring kindness, understanding, & compassion to each human and animal who comes through our doors. Whether it’s providing pet food to a family to help them keep a pet during a financial crisis, transferring animals in from overcrowded shelters, or even the small act of sitting with a scared pet – all of these moments add up to something bigger. They add up to a community whose daily actions create an environment where both people and pets can feel safe, happy, and loved. As a team, we circled around what the right word is to embody this culture of compassion. “Humane” describes the work we do daily. We invite you to join us on our mission to change the lives of more animals and people every day. We know that with your help, a more humane world is right around the corner. 2016 was another great year at the Animal Shelter. With more animals going home, more participants in spay/neuter clinics, and our humane education programs reaching more children, 2016 was a year of breaking records. We have a lot to celebrate with you – in addition to important programmatic statistics, we’ve also peppered in some other fun numbers from this past year. Enjoy! 1. Sympathetic consciousness of others’ distress together with a desire to alleviate it. Whether families are looking to adopt for the first time, utilizing the free Community Spay/Neuter clinic, volunteering their time, or surrendering a pet, the Shelter strives to have open doors and open arms for everyone. In 2016, 629 animals found their forever homes through the Animal Shelter, a 40% increase in adoptions since 2013! 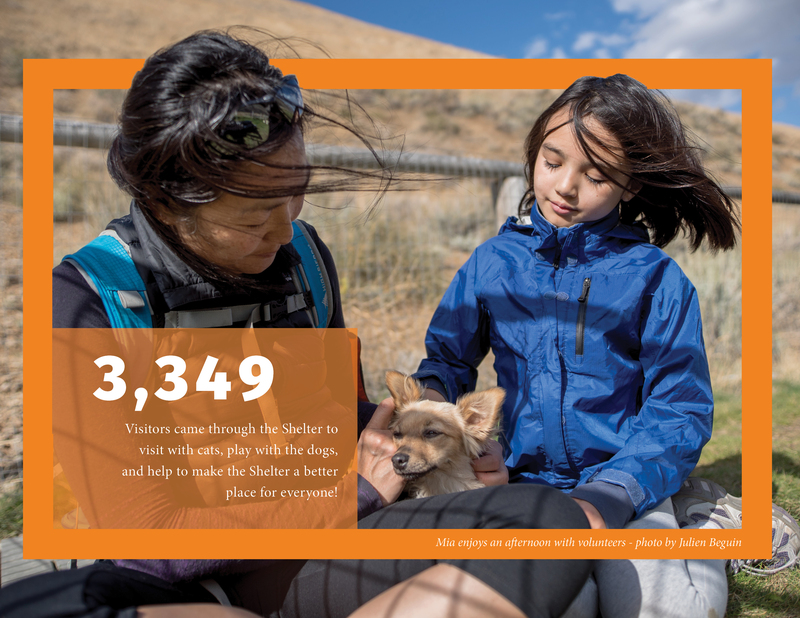 Each year, more and more families come to the Shelter to adopt – local families are adopting more pets, in addition to people being drawn from around Idaho and beyond through the Animal Shelter’s reputation and extensive outreach efforts. By opening their lives to a homeless pet, adopters are giving a loving pet a second chance at family. And in return, they receive so much. Compassion is felt in every action at the Shelter and each moment ripples out into the community – making life better for both animals and people! 1. The quality of being friendly, generous, and considerate. 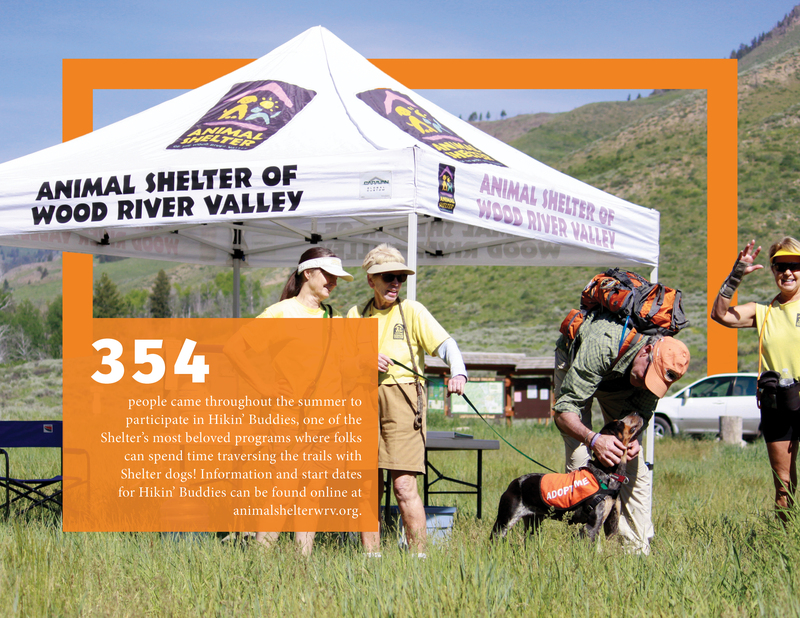 Many of the rural communities surrounding Blaine County cope with an “animal welfare desert” – these are towns with little or no access to veterinary and shelter services. The Animal Shelter received a grant from the Humane Society of the United States to be the first shelter in the nation to implement the Pets for Life outreach program in rural communities – bringing free spay/neuter, vaccinations, food, and other resources to help animals stay in their loving homes, while preventing pet overpopulation. Our work on Pets for Life in the communities of Fairfield, Dietrich, and Richfield has been so successful that we implemented a similar version within Blaine County called “Community Paws.” Our outreach team provides food, spay/neuter clinic transport, and support for community cats and other pets in pockets of Blaine County struggling to access our services. We are building a mutually beneficial network that is able to provide better care for pets region-wide. Taking healthy, adoptable animals facing euthanasia and bringing them to Blaine County means not only are we saving more lives, but local families are benefiting from this coalition by having a diverse and changing adoptable pet population. The ever increasing number of adoptions we’re making possible completes this circle – showing kindness and generosity to our regional neighbors and underserved Blaine County residents is bringing more love to our own community! From youth programs and visits to the local senior centers to community participation in adoption events and volunteering, the Animal Shelter offers a multitude of opportunities to interact with both people and pets. As a hub for compassion and connection, we strive to provide people with meaningful connections to the individuals who call this Valley home. As our capacity for programs grows, we’ve been able to have more and more students come to the Shelter for our Humane Education programs. While this program is still in its early stages, there is a growing movement among educators to include character and humane education in their school curricula as a way to teach students respect, responsibility, empathy, and to help them develop critical thinking and decision-making skills based on compassion, tolerance and integrity. The Animal Shelter is proud of our role in making Blaine County a more compassionate and humane community for all! 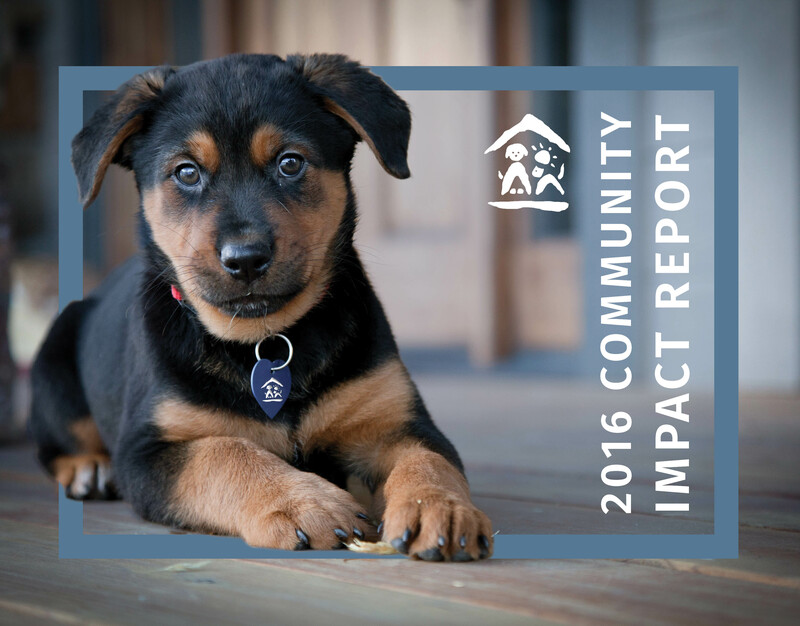 The last few years have seen unprecedented investments in the Animal Shelter by the community and our supporters from all over the nation. 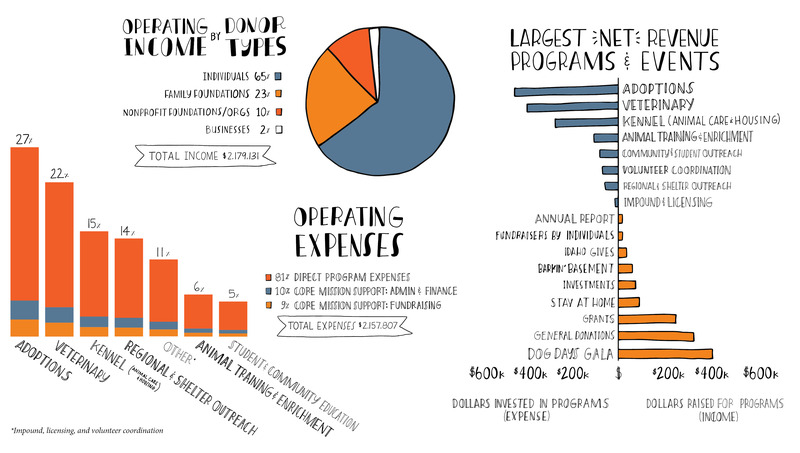 Your investments, whether $5 or $5,000 are truly transforming our ability to accomplish the organization’s mission. 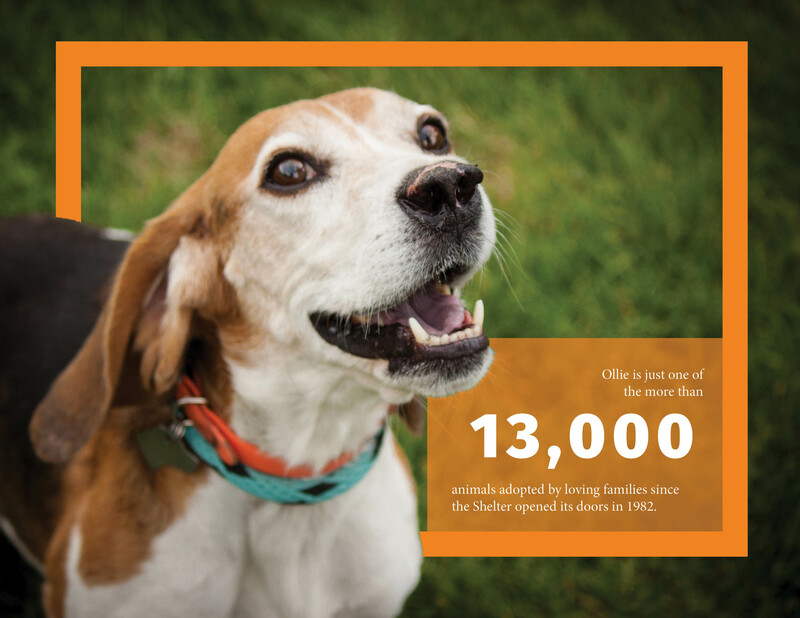 Every year, our program numbers continue to increase, resulting in more animals’ lives saved and more people’s lives changed. Even as we move toward building a new campus, we continue to invest in our ongoing operations, ensuring the community’s day to day needs are met while we move toward an even bigger vision. For full details, you can find our annual 990 tax return and audited financials here.